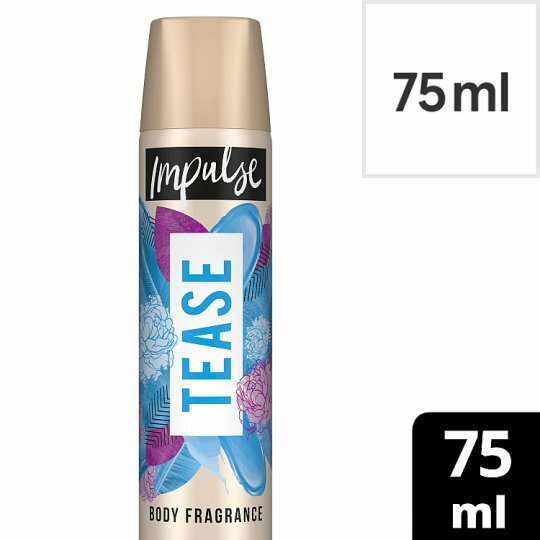 Impulse Tease Body Spray deodorant 75ml is part of Impulse’s body spray range featuring a variety of exciting and fresh fragrances to suit your every impulse. This perfect 75ml size means it easily fits in your backpack and can be enjoyed at school, after the gym or just on the go. Enjoy this fragrance anytime, anywhere and Trust Your Impulse. Tease is an addictive scent with hints of tempting fruits and delicious undertones. With a teasing modern and fruity top notes such as pineapple, mandarin and red fruits. This is complemented by transparent freshness of forbidden fruits and delicate flowers such as rose, peach blossom and pink peony, ending with sensual notes of vanilla sorbet and creamy liquid musk. An exciting fragrance with stimulating pineapple and exotic wood notes, this special fragrance will make you feel revitalized, and fresh to suit your every Impulse. Impulse is currently the number one female body spray in the UK, you are guaranteed to turn heads with this fantastic fragrance. Be super careful not to spray anywhere near your eyes and make sure to avoid broken or irritated skin. Hold the can 15cm away from the body. Simply twist the top and press in short bursts to release the fragrance.